Paint grade French door made of many pieces of pine held together by finger joints. Make sure to apply at least two coats of a quality primer to hide the finger joints. French doors are popular for living and dining rooms, or for any other room that doesn't require privacy. The door has up to 15 small windows or panes of glass separated by mullions and transoms made of wood or brass. Window panes can be flat, beveled, frosted or etched. Because of the large glass surface a french door is ideal for bringing in more natural light into an otherwise dark room. The room shown in the photo used to have two mahogany slab doors, one leading to the lower basement level and one to the back entrance hall. Both doors were replaced with French doors and look how much natural light is now coming in to the room through the back door window! See photo below center. French doors not only add more light to a room, they also create an open concept feeling. Even though two rooms are separated by a door they are still "connected". French doors with frosted panes of glass are ideal for rooms which need some form of privacy such as studies, libraries or home office. Over the years many sliding patio doors have been replaced by a double set of french doors, also referred to as garden doors, as they open to a garden or backyard. Garden doors are also ideal for moving large items in or out of the house as both doors will fully open. French doors, used inside or as garden doors, not only add natural light or "space" to a room they also add resale value to a home. 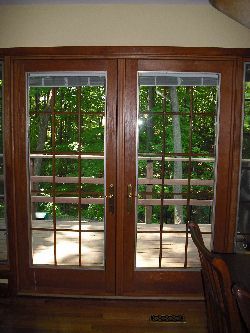 Common widths for french doors are 30, 32, and 36 inches. The standard height is 80", which can be trimmed if necessary. Make sure you trim from the bottom of the door, not the top! Common materials for french doors are oak, finger joint pine for painting and solid pine for staining. Rough Stud Opening (RSO) for a french door: Two inches (50 mm) wider than the door itself and two inches (50 mm) higher than the actual door. Standard interior door are 6'-8" tall (2.03 m).